will you include Add points to room to the Plan top menu? No, because it would require to introduce a new kind of selection that would let the user select a point in the plan without losing the current selected room. I get this feeling that future use of SH3D will rely more and more on the right-click context menus. This is the main reason why these new Add point to room and Delete point from room menu items didn't appear yet. A good user interface should make available all the possible actions in the main menu, but as said previously, it's almost impossible for these items as well as the Select object / Toggle selection menu to appear elsewhere than the contextual menu, because they need a point. You may like contextual menus, but keep in mind that many users are not used to it (mainly Mac OS X users), and those people might completely ignore that these features are available. The Online version doesn't come with a menu bar because it's not common to have one in such a part of a web page. But the more I think about it, the more I want to add an option in the Online preferences that will let the user show this menu bar (after all, Java makes it possible easily). Keep in mind that the menu can be seen like a mini user's guide that people explore to learn how to use a software. YGYL, thanks for your suggestion about "hollow point" but I have no idea about what you mean! Still no problems with 5beta. Points taken. ..it's almost impossible for these items as well as the Select object / Toggle selection menu to appear elsewhere than the contextual menu, because they need a point. Quite, and I like the logic of your approach. Still, life also moves on, it is not that long ago that the Unix/X interface was designed for three mouse buttons, Win for two, and Mac for one. While many users may not be used to context menus, they work so well and are so easy to use in SH3D that I think many users would find exploring them worth while. The beta has been very stable -- which is a good thing, as I mistakenly managed to open *and* save a current project using it. o The improved Collada import is much appreciated. Unfortunately, the function isn't quite ready for prime-time, I fear. I've found two problems: First if you expand a group and select one of its components, you can't always move from object to object correctly. That is, using up- or down-arrow from one item to the next doesn't work; focus skips randomly among the items, and some items sometimes can't be selected at all. I haven't tried the other modifications, yet. Oh, BTW, I'm still using XP on this machine, so before I could do anything I had to increase the stack to 1024mb -- which worked just fine. When would the downloadable version of SH3D 5.0 launched? Just waiting for the same egerly. I have no response problem. I was raised hopes. I hope to have more of a feature on the new features. To do this you must draw.Too cumbersome. Do you mean to be able of create a room which you can manage and from which you can get info like the area, while it remains invisible (white) in the plan instead grey? I speak of the plan only because in the 3D view you can simply uncheck the "show floor" and "show ceiling" checkboxes, but certainly it cannot be "hidden" in the plan. I think what is meant is a "room" that surrounds an empty space. You have a house, and you want to add a green surface around the house to simulate a grass patch. You would then need something as in the example. I draw something like that quite often for basic landscaping of gardens, garden paths, etc. You have a house with a patio. The patio is covered with tiles/paving, but in the centre there is a grass/garden patch. The 'paste style' function works well and is *much* appreciated. 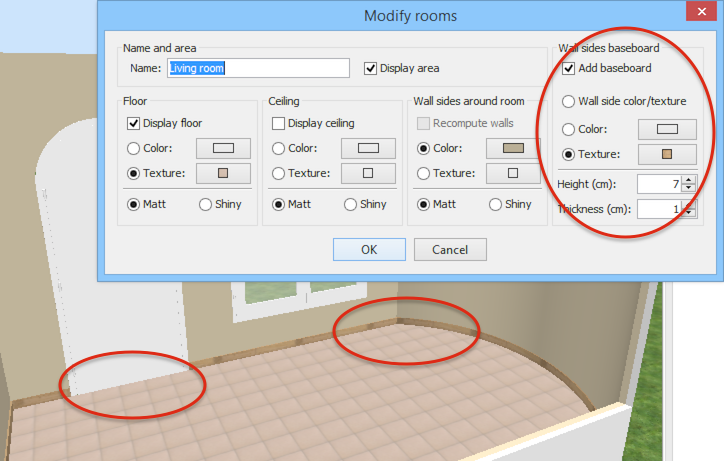 The room modification pane and wall modification pane were modified to let you select the baseboard you want on the walls around a room, or on each side of a wall. You can add a baseboard along straight or round walls, choose their height, their thickness, their color/texture or use the same one as the color/texture used for their wall side. Baseboards are cut by doors and windows that intersect the wall along which they are set (actually, baseboards are computed more or less as small walls in the 3D view). Their profile can be only rectangular. Objects with no elevation are magnetized along baseboards sides instead of walls sides when they are moved around. As soon as their elevation is greater than zero, they will be magnetized along walls sides without taking into account its baseboards. One last thing, you can also use baseboard to cover a part of the wall with an other color or texture if you set a big height. That should make it easier to add tiles on top of kitchen cabinets or around a bath. Do you use so many big textures? I paid attention to reprogram up dans down arrow keys to be able to select groups and items in groups, and then select items in previous or following groups, but you seem to have found a case I forgot. Could you test this feature again and detail how to reproduce the issue you encountered? it appears actions taken against one item within a group may sometimes be applied to all. I remember I experienced this behavior at a moment, but thought I fixed it correctly. Please, detail steps by steps how to reproduce this issue with a small example using the current beta. When would the downloadable version of SH3D 5.0 launched? I generally don't release installers for beta versions. If you're a programmer, you can download the source code from CVS and build one yourself. Baseboards: Much appreciated. I'm very happy not to be hand-positioning baseboard and corner mouldings; I'm hoping it will also reduce somewhat the throw-weight of my plans and the frequency with which my attempts to render crap out. I have a thing against rectangular baseboards in real life, but they look decent enough in the renders. I'd say 80% for appearance (as compared with, um, more molded moulding) and 500% for ease of use -- so a definite win. However, they don't seem to work correctly with all doors, yet. Treating them as small walls means door depths have to be increased by the depth of the baseboard, which in some cases results in an unnaturally deep door frame protruding from the wall. I haven't tried creating a wall with baseboard and then adding a door, so I'm not sure if the door defaults to (width of wall + width of baseboard(s)), but when adding them to an existing room, I had to hand-tweak every door. In addition, I couldn't get them to work at all with two doors. One was a slightly unusual import from 3DWarehouse: One of the Kolbe models, it's only framed on one side of the model, which may have confused sh3d's automated SVG knock-out creation. The other was sh3d's standard 'door frame' model, which I could never get to knock out the baseboard. This probably screws up and/or unnecessarily complicates your 'small wall' model, but my preference would be to treat baseboards as having no depth when calculating door or window cut-through. 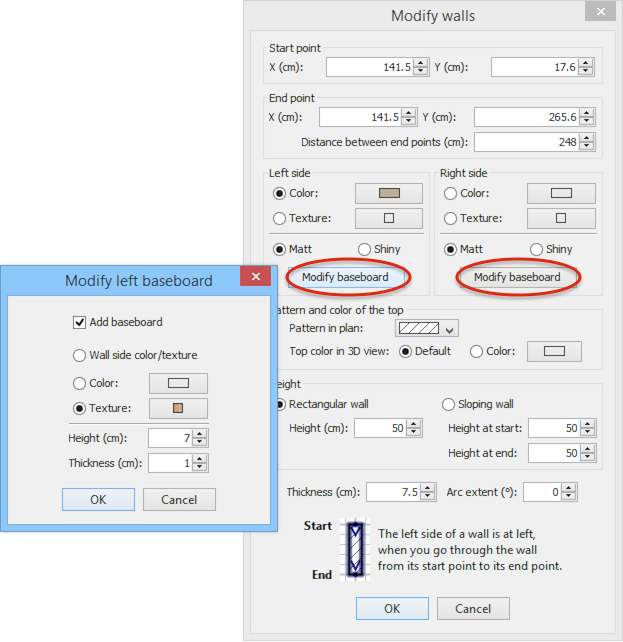 That is, if (depth of door >= wall thickness) then do not display baseboard. I find I'm using them more and more frequently as I try for more photo-realistic renders. Obviously, it's not that huge a hassle to confirm I do want to use an unadvisedly large texture image -- but on the other hand, I can't imagine ever doing so by mistake, so it would be nice to be able to disable this check. I'll double-check the two issues I reported with modifying items within a group and see if I can reproduce them with the second beta.